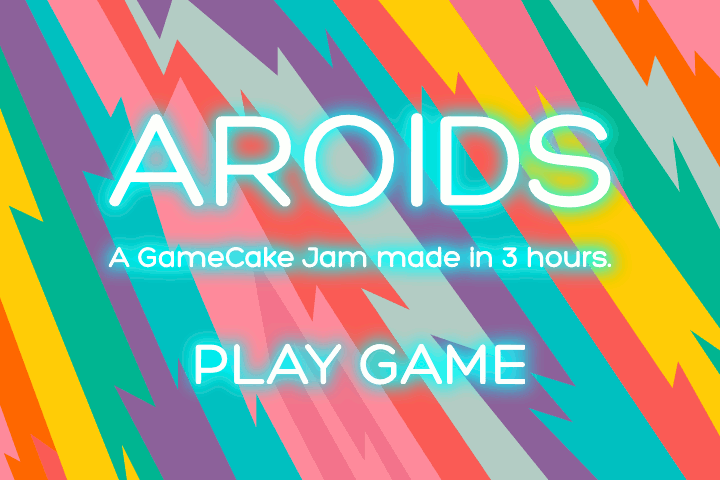 Play Aroids online at http://play.4lfa.com/gamecake. Last night, we had our very first live game coding session with the games community throwing suggestions as we furiously hit keyboards and consumed coffee. Yes, that's an asteroid clone cleverly name Aroids. We only had 2 hours and it was a slow start; noone but us was online within the first few minutes so we picked asteroids. I remember it fondly, playing for the first time when I was 8 on my old pc box in the 90s and struggling with the thrust and rotate concept. It did feel like I was navigating a spaceship assaulted with scary space rocks and aliens. Anyway, here is a "screenshot". 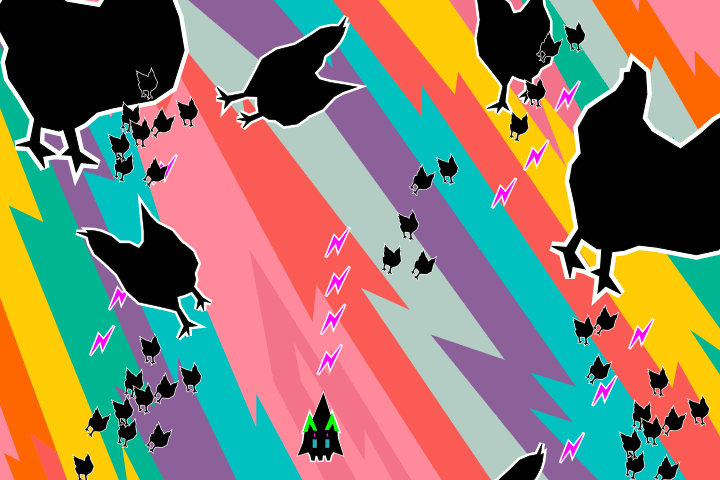 Yes, you are shooting space chickens in a psychedelic hellspace. These are suggestions from the users in chat. Suggestions will be implemented when possible, it is part of the plan. Well, the original plan, which was conceived the night before, was to create a game in just 2 hours using the GameCake Framework. The main idea being by the time we've done this a few times, there will be a library of games that have used the framework which then others can download and tweak for their own learning and/or profiting purposes. Well, let me just post the "official" proposal here. Time: 9pm GMT start and 11pm GMT end so 2 hours in total. Date: every 2nd Wednesday of the month. Two hours is not very long, however, since there is plenty of pre written code to start with. It should be long enough to put together something similar to say an early 80s arcade game. See quip on the gamecake page for an example of what I think we can achieve. So what have we learnt? That 2 hours isn't very long at all! Or rather, it was not long enough for the process to be completed so we stretched it out for another hour. This seemed more feasible. Also, ustream was very spammy, a nightmare to configurate and did not fully support seamless interaction with anyone watching which made it horrible to use. This prompted a last sprint to search for other viable means of virtual publishing which led us to Google Hangout. We made the mistake of hitting the "Make Public" button when we realised the kids in chat had to be logged into G+ and add us before they could even access anything on that platform and oh boy, what chaos ensued before us. I suppose it's the same when you go into the public rooms in our chat; we call it the cesspit for a reason. So you know, if you're feeling unloved, bored or lonely and need someone to talk to, just hit the hangout and make it public! In the end, we used a combination of two things ~ ustream (http://www.ustream.tv/channel-popup/game-cake-jam) for streaming with the added bonus that everything will be recorded (up to 3 hours!) and our own real-time chat system at http://play.4lfa.com/tv/gamecakejam . You needed two browser windows placed next to each other so you could watch the live coding session and chat with us at the same time. I thought it went rather well. Anyway, it only took about a hour or so to upload it on youtube and here it is in its full glory. ustream allowed only one window to broadcast live else we would have included the non-coding part of the development team and the chat session with the users in all its whole wet glory; there were a few screens being used at the same time in total. Probably the simplest way to play at the moment is to checkout this master repo. You will need mercurial installed. and run start.sh on linux or start.bat on windows. This should work for now. A much easier way should be sorted out RSN. I should probably make a library and add all this to it on the gamecake site.